The Smart Man and I are off to the movies this morning to see The Incredible Hulk at the cheapy "before noon" show. 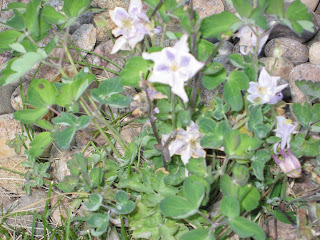 Until I return, here is a somewhat blurry picture of one of the Columbines that grows in the rocks in front of our Yellow House. For those of you not "in the know," Columbines are the Colorado State Flower. Hardy little devils. I have columbine, but it doesn't particularly thrive. I think it gets too much water where it is. Michelle, Colorado is pretty dry most years, so you could be right.